Graphite Insulating Lining Paper has the added benefit of containing graphite in the polystyrene. 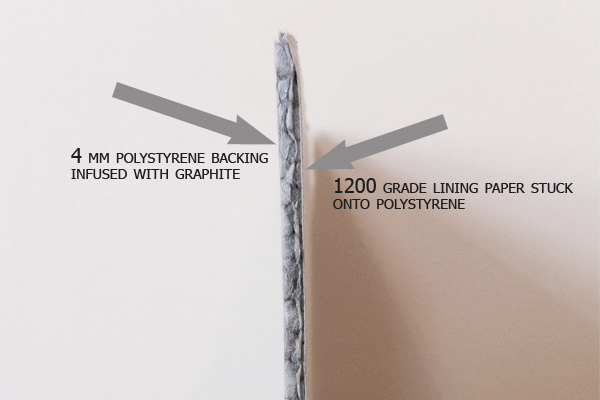 Graphite simply makes it even more difficult for the heat to pass through the polystyrene and reflects more heat back into the room – up to 20% more when compared with standard polystyrene. Wallrock Thermal Liner is the most advanced of the three products and offers very good and proven results. Apart from the manufacturer's claims (that it reduces room warm up time by up to 65% and can offer up to 36% energy saving) it's been tested in the UK by BBA – a major authority offering approval of construction products. The thermal liner is 3.2 mm thick. 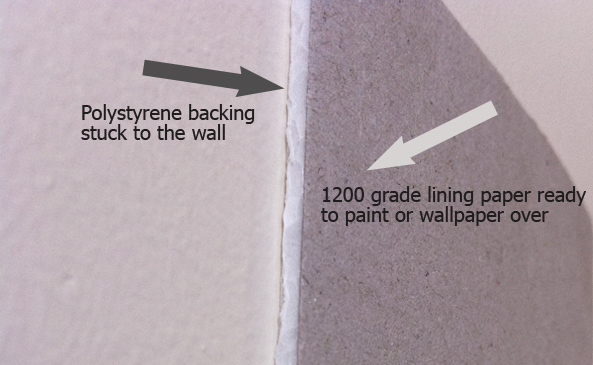 The insulation backing material has been covered with a liner and once applied to the wall it can be painted. As well as excellent thermal insulation all three products offer another great benefit. Due to their thickness they cover damaged surfaces very well.